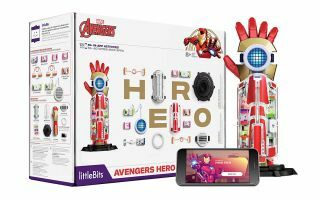 The littleBits Marvel Avengers Hero Inventor Kit. The STEM toy company littleBits has a Black Friday 2018 deal just might perfect for your little superhero: The Marvel Avengers Hero Inventor Kit, but you better act fast. Amazon is offering the STEM kit at a significant discount. The littleBits Marvel Avengers Hero Inventor Kit is on sale today for $100, a good markdown from its normal $150 price. (On Black Friday it was on sale for $80). The kit is recommended for kids ages 8 and up, and allows those superheroes-in-training to build an Iron Man gauntlet that they can program with sound effects from the Marvel films, and connect the kit to an app for more connected play. If the Hero Inventor Kit isn't space-y enough for you (Iron Man DID visit another planet in Infinity War! ), have no fear. The littleBits Star Wars Droid Inventor Kit (which made a big splash last year) is back, too. That set, which lets you customize, code and control your own R2 droid, is on sale on Amazon for $69, down from its typical $100.